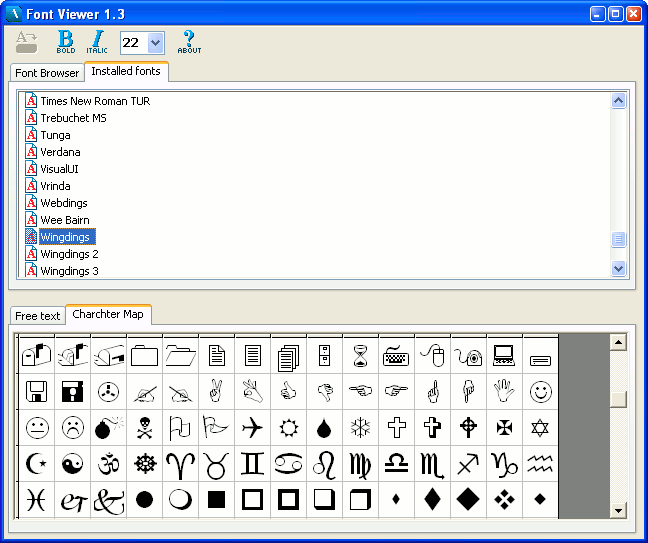 FontViewer 1.3.1 Free Download - Preview the fonts you just downloaded, without spending too much precious time! Preview the fonts you just downloaded, without spending too much precious time! Preview the fonts you just downloaded/got on CD, without spending too much precious time! With FontViewer you can say goodbye to long hours spent evaluating your brand new collection of fonts! Preview the font files contained in a directory and install only the ones you really like, without having to manually open each .ttf file! And the best part is that Font Viewer is free! Statement: First, please download the orginal installation package by clicking the download link. Of course you may also download it from the publisher's website. Using FontViewer crack, key, patch, serial number, registration code, keygen is illegal. The download file hosted at publisher website. We do not provide any download link points to Rapidshare, Hotfile, Depositfiles, Mediafire, Filefactory, etc. or obtained from file sharing programs such as Limewire, Kazaa, Imesh, Ares, BearShare, BitTorrent, WinMX etc. Software piracy is theft. If you like FontViewer please buy it.